For those who have been following our Journey we thank you for your kind support and words of encouragement. As you may have noticed from our remaining journey map our trip is quickly winding down as we approach or destination in San Diego. Though we may arrive short of our monetary goal we appreciate all who have donated for this worthy cause. Since our trip will be close to a 5,000 mile journey it would be great to meet 25% of our goal amount, (and match our mileage total), and raise $5,000 for the Susan G. Komen Foundation. If you can think of anyone who might have interest in our cause now would be a great time to send them a link to our site. 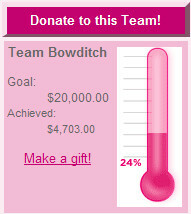 Current Donation Total: $4,000+ dollars: Effective December 27, 2009 we have a new Team Bowditch donation page located on the Susan G. Komen website. This new donation page will allow those wishing to support our Team's goal by donating directly to Susan G. Komen, thus avoiding any handling fees associated with using PayPal. We would appreciate all future donations specifically for Susan G. Komen be made through their web site per the link on our donate page (or click donation thermometer). We have now transferred most all funds raised and donated through our Paypal account over to Susan G. Komen. Donations to "Feed the Team"
If you would like to help feed the team we would gladly accept donations of any denomination to help us along the way. Our daily budget for food & toiletries is only $5 per day per person. Please use the Paypal button on our Donations Page for personal donations. TEAM BOWDITCH REACHES THE PACIFIC OCEAN !!! Clint & Paul arrived this afternoon just north of San Diego. Clint called on his cell phone while standing in the warm waters of the Pacific. Stay tuned for updated Blog entries and Photo Galleries as Clint and Paul celebrate with a week in sunny San Diego ! on 107.1 KFNV FM Radio, in Ferriday, LA. Jan. 5th: Team Bowditch makes the evening news on the CBS affiliate WRDW Channel 12 in Agusta Georgia. Check out the clip. Jan. 1st: Team Bowditch makes the evening news on the NBC (WIS) affiliate WIS Channel 10 in Columbia, South Carolina. Check out the clip. Available Now ! Team Bowditch T-Shirts have arrived ! 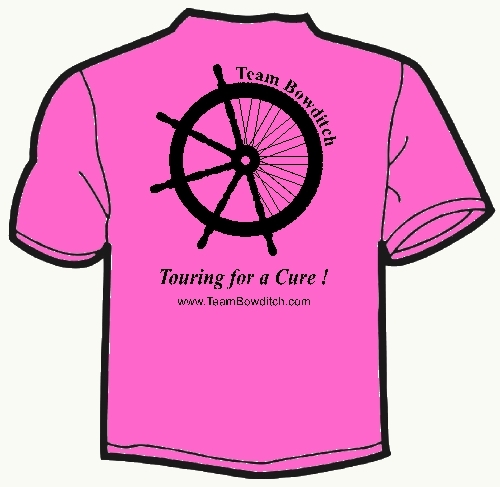 Shirts will be provided to Team Bowditch supporters for a minimum donation of $75. Shirt back shown below. Shirt front has a small Team Logo on upper left.